Submitted by admin on February 11, 2007 - 3:28pm. Joe Maumkel has been discharged from Holy Family Hospital and is recovering at home. Some of us Stanislites have contributed towards part of his hospital expenditure. While Joe recovers, The Joe We Care drive will continue till the 28th February 2007. The monies collected will be handed over to Joe to help him with his post hospitalization expenses. 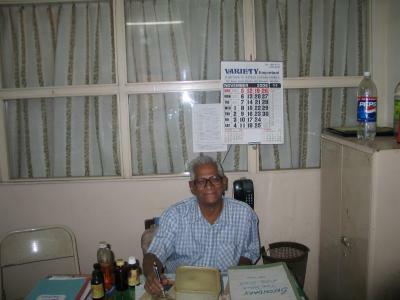 This has been his second admission to the Intensive Care Unit of Bandra Holy Family hospital in the recent past. 100 RUPEES FOR JOE - OK, I AM VERY BESHARAM! Submitted by vikram_moorjani on February 9, 2007 - 10:11am. I am sure 100 rupees is something that all of you can afford. So, instead of offerings at the church/temple/ agiary/mosque this week or this month, donate to help a fellow Stanislite. I am sure all of our God's will approve. 'BORN FOR GREATER THINGS' - DO WE EVEN BELIEVE IN IT? - YOU TELL ME! Submitted by vikram_moorjani on February 4, 2007 - 11:56pm. I write to you with great sadness that after 60 years of service of Joe Maumkel, so far only 2 members have come forward to contribute towards his illness. Are you all telling us that you dont have Rs 100-500 to spare for this good cause? We will get an exact/target amount (last week the hospital bill was Rs 43,501 and counting) that is required but write me a comment that you care and willing to assist in your own small way. While we boarders spent most of the year in house, we did have visiting Sundays and outing Sundays. The former was to allow relatives to visit their wards, and the latter was to allow the wards to be taken out for a day. On visiting Sundays I would watch with some envy the boys who had visitors and received food stuffs and pocket money. No one visited me, so you can understand. But I was engrossed with disgning and building a Dakota Airliner from icecream sticks, match boxes, cigarette packets cellopane and foil.